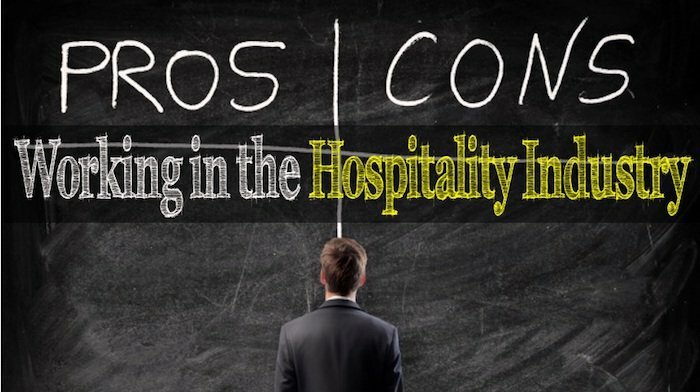 In this post, we have highlighted the Pros & Cons of working in the hospitality industry. If you are thinking about starting a career in the hospitality industry, congratulations! There are many advantages of working in the hospitality industry, which covers restaurants, hotels, travel, airlines, cruises and related companies. The perks of the job are more colourful than in most other careers, which is why many individuals opt for hospitality careers. A job in the hotel industry allows a great deal of freedom and mobility, as well as the rare opportunity to meet, service, and interact with people from all walks and corners of life. Although there are obvious advantages, there are also some disadvantages of working in the hotel industry that certainly should not discourage anyone from joining the sector. Let’s begin with The advantages of working in the hospitality industry. The hospitality industry is anything but dull. The hospitality industry offers the perfect opportunity to meet interesting individuals from all over the world including world leaders, celebrities, politicians, as well as actors. Hospitality professionals find multiple reasons to smile even amidst their busy schedule. Don’t believe me? Look at our other post with Funny Pictures of the Hospitality Industry. People that work in hotels and hospitality enjoy some of the best tips and bonuses. Some tips can go as high as twenty percent or even higher when excellent service is provided. A lot of you have to pay a hefty service charge when you stay at a luxury hotel, resort etc. or when you travel on a Cruise. This gets distributed among the staff members for providing service to the tourists and business travellers. There are a lot of other perquisites on top of tips and bonuses making the icing on the salary cake sweeter and thicker. The hospitality sector has remained relatively stable despite the tough economic times. Although the travel and hospitality sector took some hits, the industry survived and is once more vibrant and flourishing. Over the next decade, the hospitality industry is set to become the largest global employer. Various Sectors of the Hospitality Industry are set to engulf a lot of smaller industries. Musicians and artists are not the only ones who enjoy fulfilling and creative careers. The industry offers some interesting challenges that may require one to use their critical and creative thinking. One of our other extremely popular article lists some of the most Creative Jobs of the Hotel Industry. Although extremely rewarding, the hotel industry is characterised by early starts and late finishes. Most hospitality businesses operate around the clock and you may be expected to work varying shifts and extended hours. Getting into the industry can be easy; some businesses do not even require staff members to have a background in hospitality. However, it can also be just as difficult to break through to the top. It requires dedication and years of service to get to the best paying positions. The hospitality sector is all about doing everything possible to make sure that the customer is satisfied. The clients can be demanding and so can the management. If you do not know how to deal with pressure well, the expectations and the extremely high standards that are expected may overwhelm you. 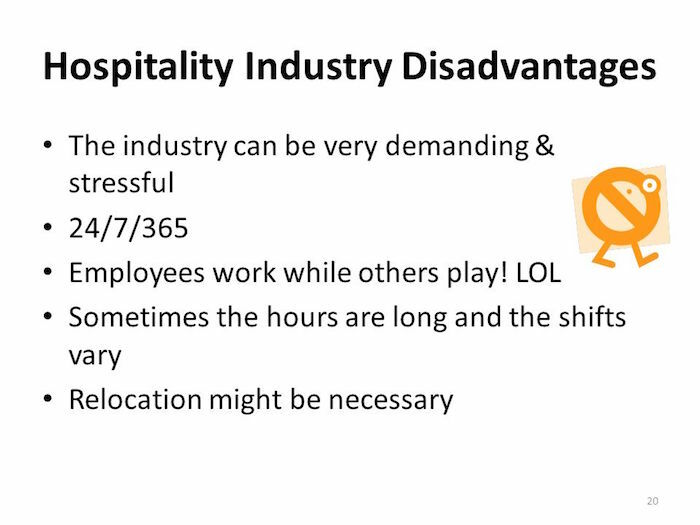 Let’s not dwell on the disadvantages of working in the hospitality industry further. Let’s leave the complaining bit and discuss why working in the hospitality industry can be a great thing to your career. The hospitality sector hires thousands of people each year. A job in the hospitality sector can be exciting and rewarding particularly if you have a passion for it. So many individuals want to work in the industry because of the job security and the wealth of opportunities that are present. Although a career in this field can be challenging, it can also be extremely fulfilling. The field of hospitality is all about interacting with people from all walks of life whether you are operating at the front office or bartending at the hotel bar. In essence, the job is all about making people happy, solving their problems, lifting their moods and facilitating experiences that will help them build memories. Hospitality jobs exist virtually in every corner of the globe. Not only does this imply that you can work anywhere in the world, it also allows you to travel. There are many positions that can satisfy the curious traveller because people are transferred to other international locations all the time. There are numerous departments in hospitality and each is important. Aside from customer service, there are also economic, sales and marketing, engineering and other broad positions that can suit someone that does not necessarily like human interaction. If you are just starting out in your career, the diversity of jobs available in hospitality can allow you to experiment until you find a career that suits you best. This characteristic is unheard of in many other professions. The hotel industry has a history that spans millions of years. Even in ancient times, there were inns and private residences available to the public. The industry has grown by leaps and bounds since then and it shows no signs of slowing down. The hotel industry is ideal for those that desire a flexible schedule. If you do not like routine and the monotony of everyday life, then a career in the hotel industry would be suitable. Hospitality has numerous perks all through the year and not just at the end of the year. While helping customers enjoy themselves, you can also have a good time while rubbing shoulders with the best and richest. Many people that work in hospitality have to be friendly to customers, which means that the sector is full of fun and vibrant people that you can have fun with. Here you go. Few of the pros & cons of working in the Hospitality Industry. Please use the search box to continue your journey to the beautiful world of hospitality.